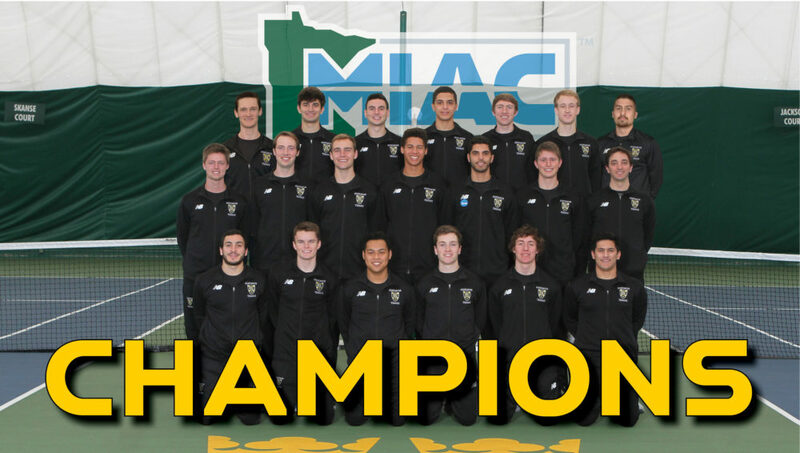 COLLEGEVILLE, Minn. – After claiming its 300th consecutive MIAC regular season victory last Saturday, the Gustavus men’s tennis team continued another impressive streak Sunday afternoon, defeating Saint John’s 9-0 to claim its 30th-straight conference championship and 52nd overall. The No. 6 Gusties finish the league’s regular season a perfect 9-0 and improve to 21-8 overall. Sunday’s victory started with a clean sweep of doubles, giving up just seven combined games to the Johnnies. In singles play, the Gusties won in straight sets in four of six spots. As the No. 1 seed entering the MIAC playoffs, the Gusties will host the winner of the No. 4/5 play-in game between Macalester and Concordia at 3:30 p.m. Friday. The conference championship is 1 p.m. Sunday and Gustavus would host if it advances.